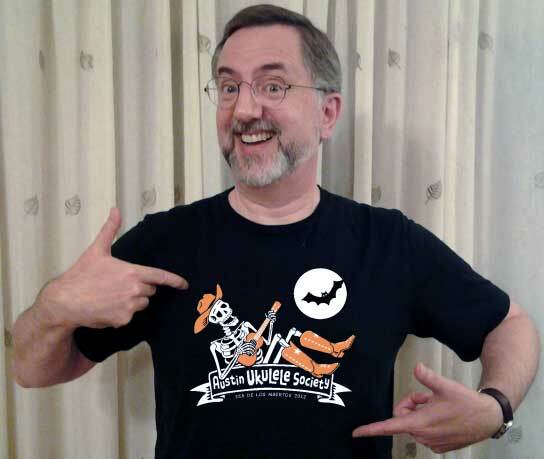 Folks– If you want one of the AUS “Dia de los muertos” T-shirts (modeled here by our very own Bob, and including an Austin trademark bat), or if you want one of our original shirts , you should drop a line to austinukes[at]gmail[dot]com. Someone will get back to you about how to order them. Both of them cost $20 each. We’ve had several requests from people near & far. We’re still working out how much the postage/shipping will be (but it shouldn’t be much! Don’t let that stop you from ordering! And it’s for a good cause–namely, promoting ukuleles in Central Texas! ).